Last Wednesday night, around 9:00, Keith Sorensen and I were heading south on I-55. We were embarking on our yearly pilgrimage to the IETC conference in Springfield, Illinois. About ninety minutes out of Chicago, we notice dozens, maybe hundreds of blinking red lights off in a dark horizon. I asked, "Did we ever find out what those blinking lights are? They're wind turbines, right?" Keith answered, "No, there are way too many of them - keep your eyes on the road." "OK smarty-pants, what are they then? ", I asked. He returned the volley, "They are signals for aircraft." "I agree, and they are mounted on wind turbines! ", I snorted. "I'll betcha (because no one from the Chicago area actually says, BET YOU) five bucks that those are wind turbines on a wind farm! 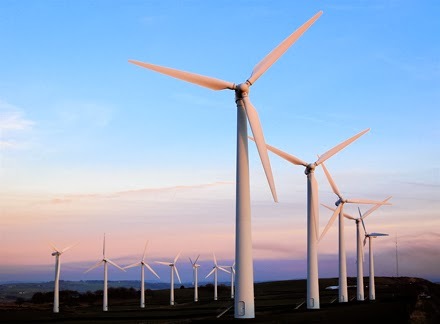 My parents live a stone's throw from a wind farm." Without answering, but rolling his eyes, Keith pulled out his cell and posted the question on Twitter. 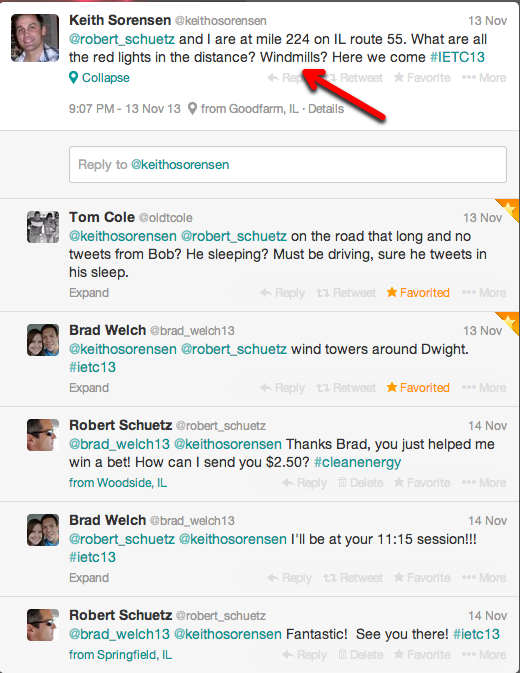 Within the hour, Brad Welch confirmed my guess and helped me win $5.00 from my friend. A short time later, I tweeted to Brad about splitting the winnings. As luck would have it, Brad was also heading to IETC and would be in attendance at our Flipped PD Session at 11:15. The next morning, as people began filing into Plaza C, I recognized Brad from his Twitter profile picture and proceeded to fish $2.50 out of my pocket. I started our professional development session by sharing my winnings with Brad and telling our story of how the three of us became connected through Twitter. Brad contributed to our presentation, and later, tweeted about our presentations to his followers using the conference hashtag #ietc13. It didn't take long for two to become three, to become dozens, and likely more. Thank you, Keith and Brad. And so it goes in the connected learning environment called Twitter, a question establishes contact. The connection becomes a conversation, and the conversation becomes a relationship. Even in this blustery, fast-paced, web-connected world, most agree that success in education is generated by great relationships. Is Twitter a great tool for flipped professional development? I'll betcha five bucks it is!